It has been a tough week at Little Plum. The coldest temperature on our outdoor thermometer read -46. Rick and I are both grateful that this deep, deep freeze only lasted 72 hours. During that time Rick kept busy with keeping cars in running condition and I hunkered downstairs to catch up on office work. Fun things like gathering tax information and balancing the checkbook. We stayed relatively warm in our subterranean digs, but after days of being below ground it was time to get out. 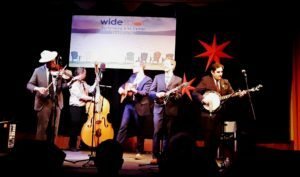 Fortunately Rick had purchased tickets to the Wide Spot Performing Arts Center in Stockholm to see a Bluegrass group from Minneapolis, Minnesota, The High 48’s. I was a bit skeptical about the travel to Stockholm. Yes, it was warm a very balmy 36 degrees (above zero); but a very dense fog with mist had settled into Little Plum Valley. Visibility was low as we took our time to drive over the big Pepin hill into the town. By the time we hit the Great River Drive the fog had cleared quite a bit and since there wasn’t a great deal of traffic we continued to the hamlet of Stockholm. The short version of last nights adventure is this….it was a great concert. These five musicians have an amazing sound and are true virtuoso instrumentalists and singers. 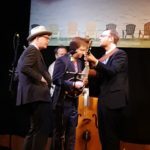 I don’t often listen to this genre of music; and after last night performance I want to seek out more bluegrass events. Rick managed to snag one of the groups CD’s. I think this is going to be a Bluegrass kind of a Sunday. OH! Do I dare dream of summer? I know that spring is around the corner….but it is hard to imagine with so much snow on the ground. Stay safe and be well.